Born in Liverpool, the son of a drawing master, Hunt read Classics at Corpus Christi, Oxford, on a scholarship. 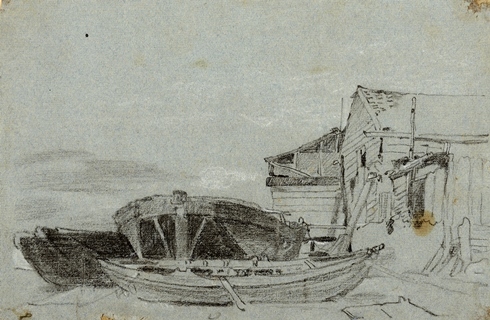 While a student, he was encouraged to draw by the Oxford picture dealer James Wyatt who had a shop on the High Street. Wyatt commissioned Hunt to go on a series of sketching trips to North Wales which he funded in exchange for the option to sell the finished works in his shop. 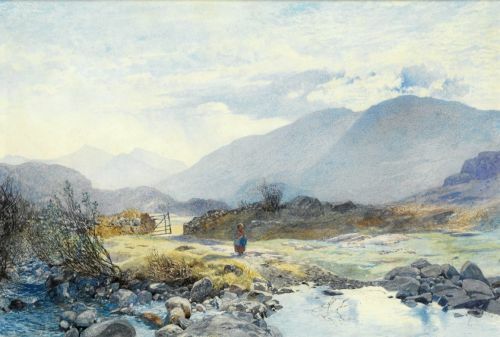 The present drawing, an early work, originates from such a trip and dates from the year of his first picture exhibited at the Royal Academy, in 1856, `The Stream from Lyn Idwal?. 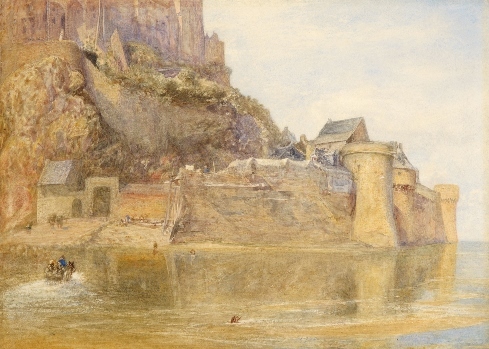 John Ruskin who had published his Modern Painters IV in April 1856, described it as `the best landscape I have seen in the [Academy] exhibition for many a day ? uniting most subtle finish and watchfulness of Nature, with real and rare power of composition? (The Works of John Ruskin, ed. Cook & Wedderburn, 1903-12, vol. XIV, pp.50-51). Sheet 24.6 x 31 cm., 9 ? x 12 in. This is a view taken from the north-west across the mouth of the River Esk towards Whitby Abbey and it is a subject which Hunt drew on a number of occasions. Hunt first visited Whitby in about 1874 and returned repeatedly. A finished view taken from the same point dates from 1881 and is entitled `A Fine Evening at Whitby? (see Christopher Newall, The Poetry of Truth ? Alfred William Hunt and the Art of Landscape, 2004, no.55, ill.). A similarly sketchy version of this view, signed and dated 1874, was sold at Christie?s in the Dawson sale, 3rd June 2004, lot 6. This on-the-spot sketch shows the influence of J.M.W. Turner. 147 x 236 mm., 6 x 9 in. This is a rare early work by Hunt dating from his Irish tour of 1846. He visited Ireland as a sixteen year old with his father Andrew Hunt (1790-1861), the drawing master and landscape artist. Sheet 285 x 395 mm., 11 ¼ x 15 ¾ in. Hunt's first visit to Whitby was in around 1874 and he returned on a number of occasions. This shows the prominent headland to the south-east of Whitby and The Scar or Scaur which is the rock area at the base of the cliffs. 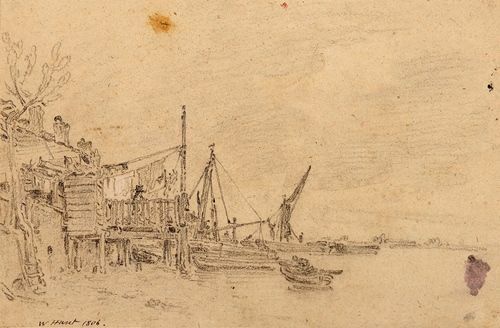 This appears to be a preliminary sketch for a watercolour in the V & A entitled `Wind of the Eastern Sea' (see Christopher Newall, Alfred William Hunt, exhibition catalogue, 2004, p.168-9, no.59, ill.) which shows the same view and is dated to circa 1888. The Abbey is taken from the south-east and the two jetties of Whitby harbour are just visible beyond the headland. 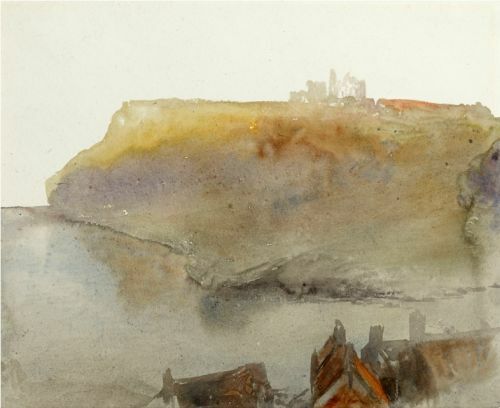 The artist's daughter Violet recalls his father's time at Whitby: `Poor Mamma pounds up Abbey Hill every afternoon to meet Papa sitting exposed on the windy hill behind the Abbey and fetch him back before he grows chilled to the bone' (quoted in Newall, op.cit., p.168). 28.2 by 38.9 cm., 11 by 15 ¼ in. This shows the barbican built at the base of the monastery of Mont St. Michel to protect the entrance in the thirteenth century. A sketchbook in the Ashmolean Museum (WA.1918.7.41) includes a number of drawings of Mont St Michel dated June 1876. Two sketches of the ramparts of Mont St Michel are in the Ashmolean Museum (see Newall, op.cit., nos. 50 and 51) as well as a distant view of the monastery (no.47) and a finished watercolour of its crypt (no.48).